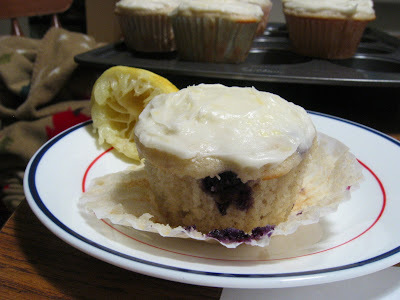 Last week, I baked a batch of Lemon Scented Blueberry Cupcakes for OCT's lab meeting. Although they were healthy and yummy, they looked depressingly ugly. So ugly that I almost threw them out of the window. I thought my poor frosting skill didn't do the light and fluffy cupcakes justice. OCT didn't even try to console me, but to reaffirm my foreboding that the ugly cupcakes would be poorly received. Place 12 decorative paper muffin cup liners into muffin cups. 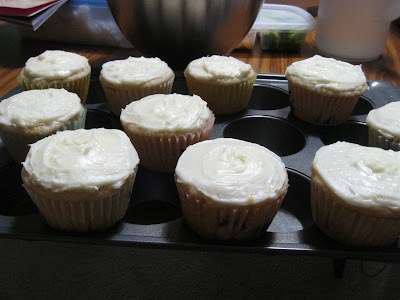 To prepare cupcakes, lightly spoon 1 1/2 cups flour into dry measuring cups; level with a knife. Measure 1 tablespoon flour; level with a knife. Sift together 1 1/2 cups flour plus 1 tablespoon flour, granulated sugar, baking powder, 1/4 teaspoon salt, and baking soda in a large bowl. Combine melted butter and egg in another large bowl; stir with a whisk. Add buttermilk, milk, and 1 teaspoon rind to butter mixture; stir with a whisk. Add buttermilk mixture to flour mixture, stirring just until moist. Toss blueberries with remaining 1 tablespoon flour. Fold blueberries into batter. Spoon batter into prepared muffin cups. Bake at 350° for 25 minutes or until a wooden pick inserted in center comes out clean. Cool in pan 5 minutes on a wire rack; remove from pan. Cool completely on wire rack. To prepare frosting, place cream cheese, 2 tablespoons butter, 1 teaspoon rind, vanilla, and 1/8 teaspoon salt in a bowl; beat with a mixer at medium speed just until blended. Gradually add powdered sugar (do not overbeat). Stir in juice. Spread frosting evenly over cupcakes; garnish with blueberries, if desired. Store, covered, in refrigerator.